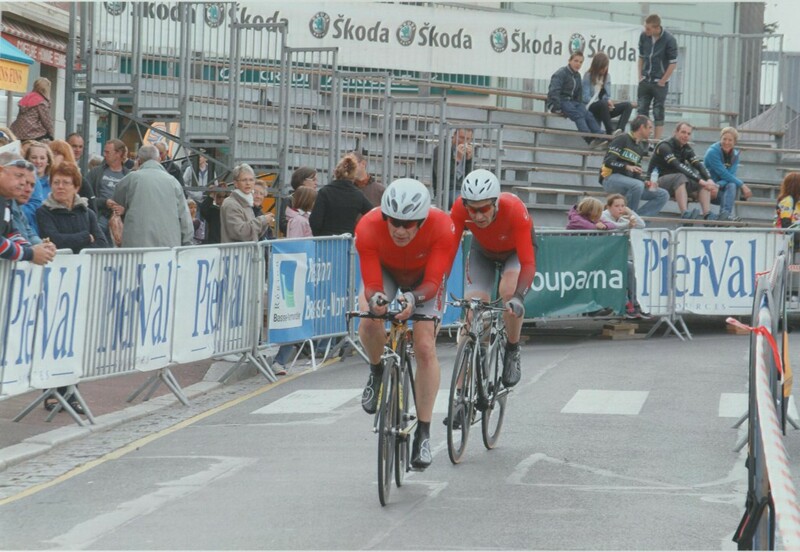 This event is usually the high point in two-up time trialling for many riders, including Team Grumpy, the informal name for the regular 2-up partnership between Gerry and I. We’ve ridden the event for 9 of the last 10 editions of this event, based in Marigny, Normandy. The course itself is a terrific one, with fast sections, short but tough climbs and equally short but spine-tingling descents all within 54.3km.We entered the Corporate category, as we had done for several years. This has the advantage of guaranteeing a reasonable start time – this year we started at 10.05am, as the organisers had put our category off before the Veterans. The weather conditions were near ideal, dry with only light wind, though a little chilly for the early starters. This was in contrast to the 2011 event in which we rode through a huge downpour. We didn’t approach the 2012 edition of the Duo Normand time trial with great expectations, which was probably a good thing as our performance was distinctly lack-lustre. Our low expectations followed problems with work-life balance causing problems with training, and of course I had that crash while racing only a few weeks before the Duo – on the day, I was still suffering from quite severe pains in my right shoulder. To this can be added travel woes caused by the Brittany Ferries strike. But that’s all a bit like contravening TG rule #1 (Remember to make your excuses before the race, not after. Otherwise it will just sound pathetic)! Add to this the usual technical issues – I managed to bring a spare rear wheel that lacked a cassette and Gerry had an embarrassingly out-of whack rear mech. Readers might choose to have a look at the TeamGrumpy twitter feed for the weekend. Lining up near the start ramp, we were delighted to attract admiring glances from two lady riders. Upon engaging them in conversation, it turned out they thought the our bikes were pretty spiffy (not their actual word, you understand). Unfortunately for Team Grumpy’s easily bruised masculine egos, when we observed that the bikes might be good but the engines were not, the ladies commented they were only interested in the bikes. Somewhat subdued by this conversation, we made their way to the start ramp. And off we went. Narrowly avoiding a start ramp collision, and up the lane. Near the top, Gerry detected the stirrings of overdoing it, and the team successfully eased back momentarily. Before long the pace elevated again and we began the usual task of reeling in earlier teams. For the most part the early km went well, will little interference from cars (though I had to bellow at one car to get out of the way to let us through). Team Grumpy’s pace slipped once the hilly sections started, and the we were caught for four minutes by the Procycling team. Gerry’s rear mech issues caused him to repeatedly drift off the back on some of the climbs, on the positive side, his usually cautious approach to descents wasn’t so obvious and he made an excellent job of the famous ‘ghoul corner’ – the fast descent with a sharp left turn. We rounded the square into Marigny in good style. It would be nice to report that Team Grumpy cornered to tumultuous applause, but in all honesty it has to be said that we were met with near complete indifference. Still, at least there was photographer there to capture us. The final section of the course is a hairpin section of road. Here we seemed to alternate between exhaustion and second (and third and fourth…) wind. At times we were cracking along at quite high speed, but unfortunately at other times merely a grovellingly low speed. We got caught by the eventual winners just as we turned at the hairpin. Eventually Team Grumpy raced through the finish line, though Gerry somehow contrived to make his final dash some metres before the actual finish line. Our result was 1:26:12, for 6th place in the Corporate category. This was Team Grumpy’s slowest time in nine outings at the Duo Normand and quite disappointing. What was alarming was the official result sheet as first released, which had us in first place with 1:16:12. What made this alarming was the potential for embarrassment, since two teams had caught us out on the road. Perhaps it was our faulty French, but it took a surprisingly long time to persuade the organisers that their time needed 10 more minutes to be added on, but eventually a new results sheet was issued.